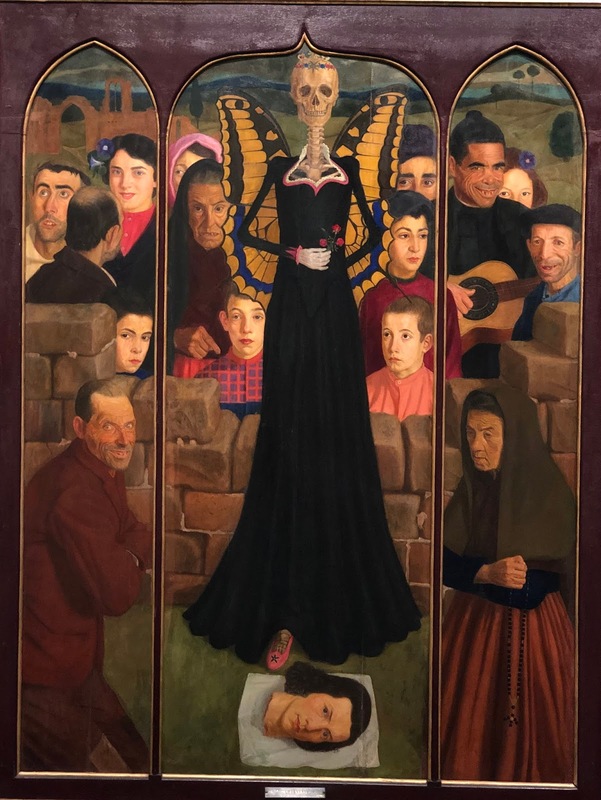 The Albuquerque Art Museum opened Part 2 of “Visions of the Hispanic World” aka “Treasures from the Hispanic Society & from the Hispanic Museum & Library”, a month after the main exhibition. It covers the period from the end of the 18th century to the beginning of the 20th. It is much smaller than Part 1 which continues and is the reason to come from near and far. To find out about Part 1 see my earlier Missive (click here). If you are a fan of Spanish Art and love Goya and Sorollo be sure not to miss Part 2 which is installed in a gallery in a different part of the museum. They have kept one of the Hispanic Society’s most famous paintings for this section, the portrait of The Duchess of Alba (1762-1802) by Francisco de Goya y Lucientes (1746-1828). When she posed for Goya in 1797, the Duchess was 35 years old and just widowed. It is said that Goya was besotted with her and the rest is speculation. In this life-sized portrait “Sólo Goya” (only Goya) is written in the sand at her feet. Note her rings where one says “Alba” and the other “Goya”. The artist kept the picture in his studio, and it was sold by his son in 1836 for the collection of King Louis-Phillipe of France. Hung next to the Duchess is a painting of Manuel Lapeña done 2 years later in 1799. As it matches in size and format, it makes an interesting comparison to the previous picture but looks far less competent. Maybe the artist was suggesting his feelings about his sitter in showing the laundry line behind the soldiers in the background! I would further guess that one of the artists in Goya’s studio might have worked on the project. There is also a group of Goya drawings including one that appealed to my salacious taste called “Tuti li Mundi” where the young lady is lying on the floor so she can get a proper view of the young man’s torn trousers as he is watching a peep show! Although in the catalog the title is interpreted as “All the World is a Peep Show”. I would translate it as, “For all the world to see”. Ramon Casas I Carbó. (1866-1932) had a fascination with the modern world and illustrated this through a set of 25 tiles. We are looking at a work of art from 1903 which shows us how far we had come in a little over a century. The first doctors’ scale (spring scale) (tile at lower center) was invented in England in 1770 and was patented around 1840. So probably only came into popular use near the end of the nineteenth century. The hot water boiler for the outdoor shower (tile lower left) might have been a boon then, but I don’t think we would be too happy with it today. On the other hand, the scale has not changed that much. The 14 canvas panorama representing the provinces of Spain done between 1911 and 1919 by Joaquin Sorollo (1863-1923) is one of the most astounding works in the Hispanic Society in New York. Sorollo was a special favorite of Archer Huntington, founder and patron of the museum who commissioned the series which is still in its original installation. Huntington acquired quite a number of paintings by the artist and three are in the exhibit in Albuquerque. 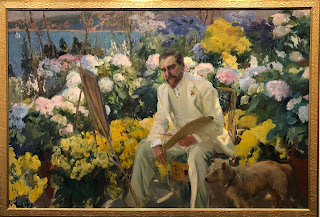 I have picked here what I believe to be the least well known of these famous pictures as well as the fact that it represents Louis Comfort Tiffany (1848-1933). 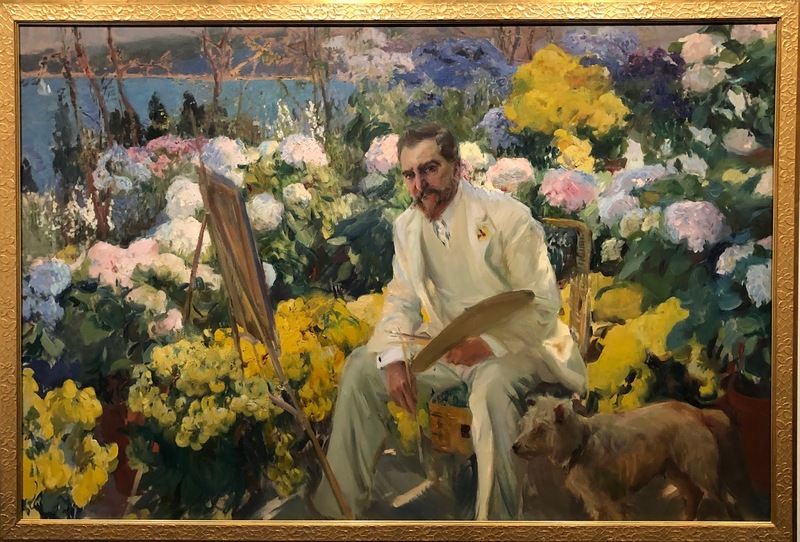 From this painting we learn as well that Tiffany, besides being a painter and designer famed for his art glass, was quite the “dandy”.